VANCOUVER, BC, February 23, 2012 Mirasol Resources Ltd. (TSX-V: MRZ, Frankfurt: M8R) is pleased to announce the results from expansion drilling at the La Negra and La Morocha silver deposits, part of a major >12,000 metre drilling program and feasibility study at the Joaquin Silver Project located in Santa Cruz Province, Argentina, which is 100% funded by Mirasol’s joint venture partner, Coeur d’Alene Mines (“Coeur”). Coeur has announced a 2012 budget of $5.8 million for exploration and feasibility activities at the Joaquin Project. In addition, regional exploration has identified several other targets where exploration and drilling has returned significant silver and/or gold intercepts (Figure 1). 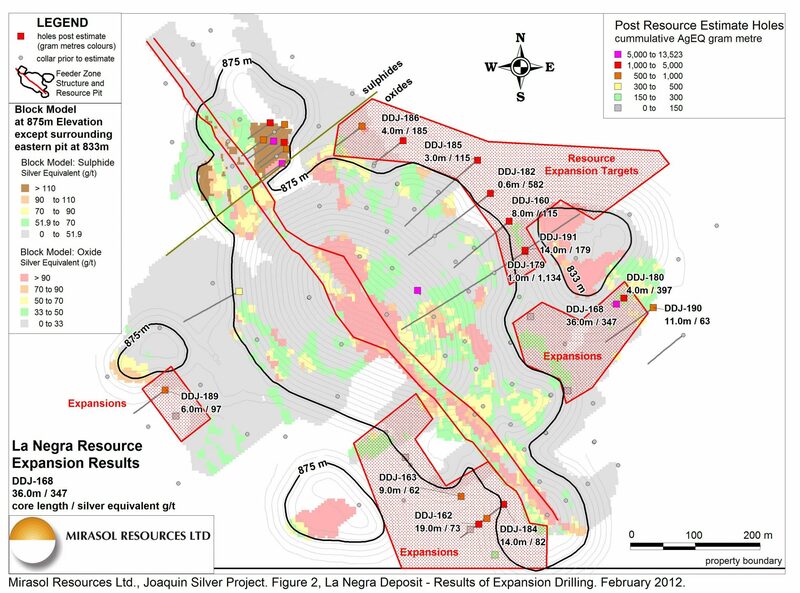 Highlights of the expansion program include DDJ-168 and 180 located east of the La Negra resource pit, where high grade silver intercepts are included within long mineralized intercepts at relatively shallow depths, located outside of the Whittle(r) resource pit (Figure 2, Table 1 and Appendix 1). Better intercepts include DDJ-168 which contains 36 metres of 343 g/t silver plus 0.06 g/t gold, including 2 metres of 4,900 g/t silver and 0.32 g/t gold in a near-surface sulphide zone. These two holes may have intersected a second feeder zone. To the west of the main La Negra feeder zone, and outside of the Whittle(r) resource pit, DDJ-162 cut 19 metres of 69 g/t silver and 0.07 g/t gold. Mineralization on the northeast side of the La Negra pit remains open to the northeast (DDJs-160, 182, 185, and 186 area), and further drilling is warranted. 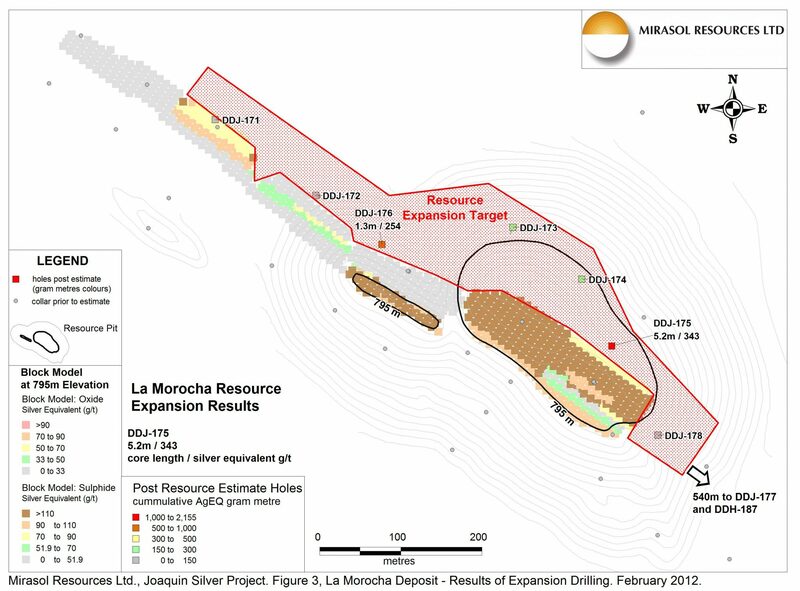 At La Morocha hole DDJ-175 cut 5.2 metres of 163 g/t silver and 2.77 g/t gold (Figure 3 and Table 1). 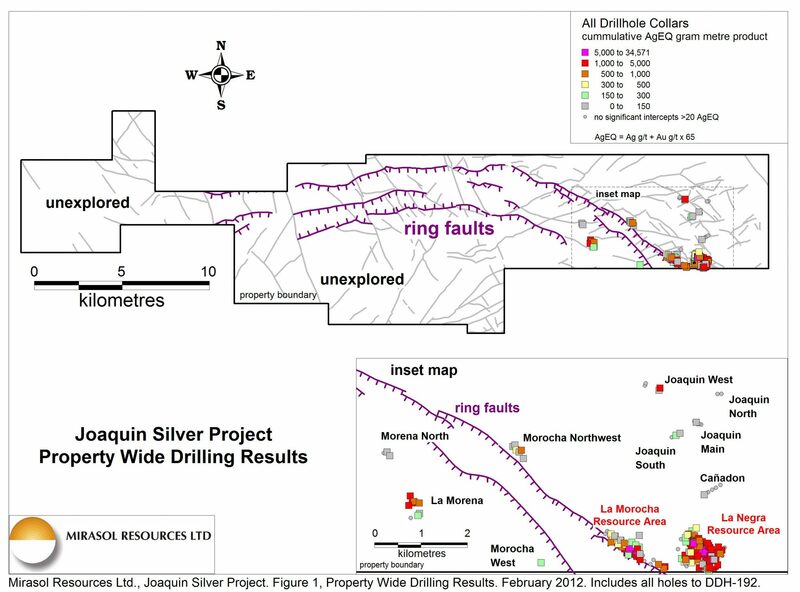 Hole DDJ-177 intersected 1.0 metre of 136 g/t silver and 6.79 g/t gold, confirming that locally gold values are significant at Joaquin. Silver equivalent is calculated as AgEQ g/t = Ag g/t + 65 x Au g/t. Metallurgical recoveries are assumed to be 100%. Primary intersections are calculated at a cutoff grade of 20 g/t with some internal dilution allowed at the discretion of the project’s Qualified Person. “Included” intersections are calculated at a 50 g/t or higher cutoff grade. Reported grades are not capped. The expansion drilling program commenced in October 2011 on the Joaquin Silver Project, where the initial resource estimation comprises 19.6 million ounces of silver in the Indicated category and 47.9 million ounces of silver in the Inferred category (Mirasol news release May 9, 2011 and Appendix 1). The current release reports results for an additional 33 holes (DDJ-160 to -192) designed to test the down dip and peripheral areas around the two resource deposits. A complete list of intercepts is found in Appendices 2 and 3. In addition to the new expansion holes, Mirasol previously reported infill holes drilled in the north part of La Negra resource area, subsequent to the resource estimation (August 8, 2011; DDJ-141 to -143 and DDJ-153 to -159). A total of 43 holes totalling 6,330 metres have been drilled as infill and expansion around the two resource deposits since the initial resource estimation (Figure 2 and Figure 3). Coeur holds a vested 51% interest in the Joaquin project, and has elected to proceed to increase its equity to 61% by funding all expenditures through to the delivery of a full feasibility study. Our JV partner informs that it intends to re-calculate the published resources for the La Negra and La Morocha deposits in Q2 of 2012 and is resuming metallurgical test work on both deposits. Currently our partner is focused on an infill drill program of >10,000 metres of drilling, to include metallurgical drill holes. These activities form part of a planned feasibility study. Surface exploration has been undertaken to the north and west of the La Morocha deposit following a series of ring fractures which appear to focus mineralization (Figure 1). The work comprises geological mapping, rock chip sampling and also PDP-IP geophysical surveying (pole-dipole induced polarization). Much of the property remains unexplored and only a small part has been drill tested. Mirasol expects Coeur to resume exploration drilling to test several new targets prior to the southern hemisphere winter. Mirasol Resources Ltd. is a prospect generation exploration company focused on the discovery of new, high-potential precious metals deposits in the Americas. Mirasol currently holds 100% of the rights of twenty exploration prospects, including eight advanced exploration stage precious metals properties located in Santa Cruz Province southern Argentina. This includes the exciting Virginia Silver Project where near-surface, oxidized silver vein mineralization is being outlined by shallow diamond drilling. The company operates subsidiary companies in Argentina and Chile, holds the strategic Rubi copper-gold porphyry property in Chile, and is engaged in generative exploration in prospective regions elsewhere in the Americas. Paul G. Lhotka, Principal Geologist for Mirasol, is the Qualified Person under NI 43-101 who has approved the technical content of this news release. Quality Assurance/Quality Control: Coeur d’Alene operates the Joaquin Joint Venture and generated the drilling data used in this news release and reported it to Mirasol. Drill core samples were submitted to Alex Stewart (Assayers), Argentina S.A. and ALS Laboratories, both ISO 9000-2000 accredited laboratories located in Mendoza, Argentina. Gold and silver results were determined using standard fire assay techniques on a 30 gram sample with a gravimetric finish for gold and silver. Coeur’s QAQC program includes the insertion of blanks, standards and duplicates into the sample stream for Joaquin drill holes. Mirasol has performed an independent analysis of the QAQC data generated by Coeur. Dr. Paul Lhotka has reviewed the Coeur data, calculated the intercepts in this news release, and is a qualified person as defined by National Instrument 43-101. Notes as per Appendix 2.